Be courteous, considerate of others and use common sense on the driving range. To be successful in a game as difficult as golf, you need to practice. Very few people can head out for a round and post a good score without working on their games beforehand. Practicing at a driving range is a perfect way to get better, but there are some things to remember. You need to follow the rules and be courteous of the facility and others joining you on the range. All driving ranges are unique. At some, it is required that you only hit from a mat. Others allow you to hit the ball off the grass. It is important to follow the rules. Stay within the boundaries. When hitting from the grass, replace divots as much as possible. Also, most driving range facilities ask that you hit each ball close to where you hit the last one. This minimizes the area torn up from hitting the balls and makes it easier to repair. The area will inevitably see some wear and tear, but do your part to minimize the damage. Be aware of your surroundings. If there are not dividers to separate tee areas, make sure you are far enough away from others so you don't come close to hitting them. Although there usually is not a uniform distance between golfers, try to be at least two driver club-lengths away. Before you swing, look around to make sure that nobody is behind you or about to walk by. Give yourself plenty of room. Never walk out on to the range to retrieve balls: You risk being hit by a golf ball. Remember that you are sharing the range with others. Keep the noise down so you do not disrupt them. One of the biggest things to remember is to keep your cell phone turned off or set to vibrate. Some courses do not even allow phones. If you need to take a call, do so away from the range. Avoid sudden movements in the direction of a player about to swing. Hitting a golf ball takes concentration so try to not distract others. Golf courses have to deal with the fact that some people steal range balls. 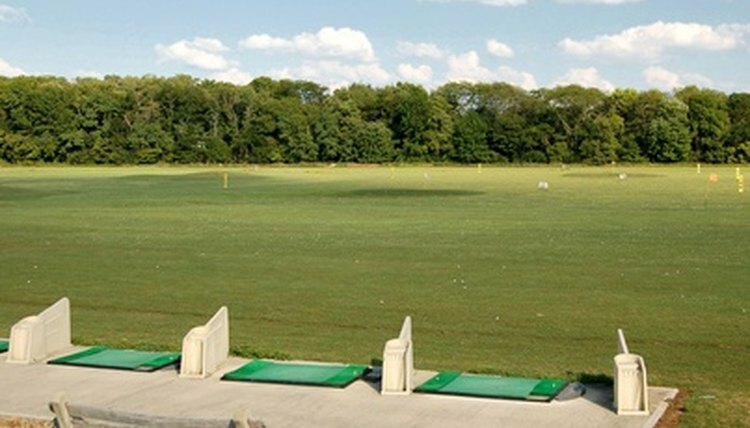 The driving range is a cheap way to fine-tune your game. Don't take the balls. Most driving range facilities also offer putting greens and short-game areas for people wanting to work on chipping and putting. Treat these areas as you would a green on the golf course. In doing so, you ensure the next person to use the greens will have the same experience as yourself. Do not chip on to these greens from the driving range. Doing so presents a serious safety hazard. When using the driving range, hit balls out to the main collection area. Matt Crownover is the sports editor at the Lebanon Express in Lebanon, Ore. He primarily covers high school athletics and maintains the paper's online blog. Matt holds a Bachelor of Arts in Journalism from Eastern Washington University in Cheney, Wash.
How Does Rain Affect Golf? How Does a Golf Rangefinder Work?